I have this childhood memory I am very fond of. It involved making a decision as a kid and thinking about it cracks me up all the time. So my mum, her brother and I went to the supermarket to pick some items. My uncle told me to pick what I wanted for myself and after looking around, I requested for just one pack of pringles. He asked if that was all i wanted and I said yes. When I was told to pick whatever I wanted, it felt like that was the biggest decision i ever had to make and after checking all I thought about was getting a pack of pringles. Just one. Can you imagine? Till today, I am still not sure if the choice i made was because I needed only the pringles or because I was put on the spot and had no idea what to pick. Was i overwhelmed? I often tease my uncle to take me to the supermarket now that I am older and give me the same opportunity. You can guess what will happen right? I totally miss those time when the only decisions we had to make was choosing what we wanted and it will be handed to you on a platter. Well, ‘growing up’ happened and we now have to make more serious decisions and even work extra hard to ensure our decisions are the right ones and will lead us to achieving our desired goals. Making a decision especially when you are not sure of the possible outcome is really tasking and mind draining, but wasting time before deciding is even more dangerous. How do you make a decision when your goal is time specific? Being decisive is a process that every successful person have had to undergo. To live a meaningful life, we need to be able to make effective decisions in time and see it through (being firm and not changing our mind often). We need to be decisive for our personal goals, for our family, for our kids and our friends. There are definitely challenges that will come with making decisions. We never have enough time to deliberate, we are sometimes afraid, uncertainty and lack of confidence are just some of the reasons why we keep stalling. Over the years I have transitioned from being told what to do, to making decisions on my own and to also sorting other people’s opinion before making a decision. This is the same experience with a number of us. If you cannot be decisive on certain issues, this post will list out some tips that can help. Always remember, it is better to try than not trying at all. If you find it difficult to be decisive, you need to first clarify that ‘you’ are not the problem. Be sure you have a mind of your own, you can accept yourself and the decisions you make. Read Acceptance (Love yourself, Flaws and All) to find out how. Have a clear and realistic goal: There are too many decisions that have to be made, and you cannot do everything at once. Take it one goal at a time. Find out if it is a time specific goal: You need to know how much time you have to deliberate. It is important so do not miss an opportunity. List out the possible pros and cons: You really should find out what you stand to gain if you make the decision or what you stand to lose if you do not decide. Is it convenient? What compromises are involved? Try not to think too much rather talk to only people who will give their sincere opinion: Avoid pressure at all cost and sort the opinion of people your trust. Find out people who have had previous experiences and are willing to share. Pick only the points that align with your goals. Learn to manage your expectations: This is important for the period when you have to wait for an outcome of the decision you have made. Do what needs to be done: Implement your decision, be firm and remain hopeful. It is better to be boldly decisive and risk being wrong than to agonise at length and be right too late – Marilyn Moats Kennedy. Living a meaningful life is basically making the right choices for ourselves, career, partner, kids and as required. Little decisions like what to prepare for dinner or what outfit to wear to the beach all add up to making our life meaningful. Regardless of the big decisions or small decisions you have to make, always ensure it tilts you towards achieving your desired goal. If you enjoyed reading this post, please share your thoughts in the comment section. Have you ever lost an opportunity because you were indecisive? Do you make better decisions now? We all have that one person we have to pass our ideas through before making a decision, do you think it is helpful? Tell me, you know i love to read from you. Love this post because decisiveness is a big problem for me. I simply bail out of the process and more often than not use the random number generator app on my phone to make my decisions for me! Great post and theme for the Challenge! Good luck! As one who is quite indecisive, you make so do-able. I’ve always suffered in making decisions at crunch moments but your article has given me a kinda kick or you can say motivation rather. Thanks. Good tips for making up your mind. 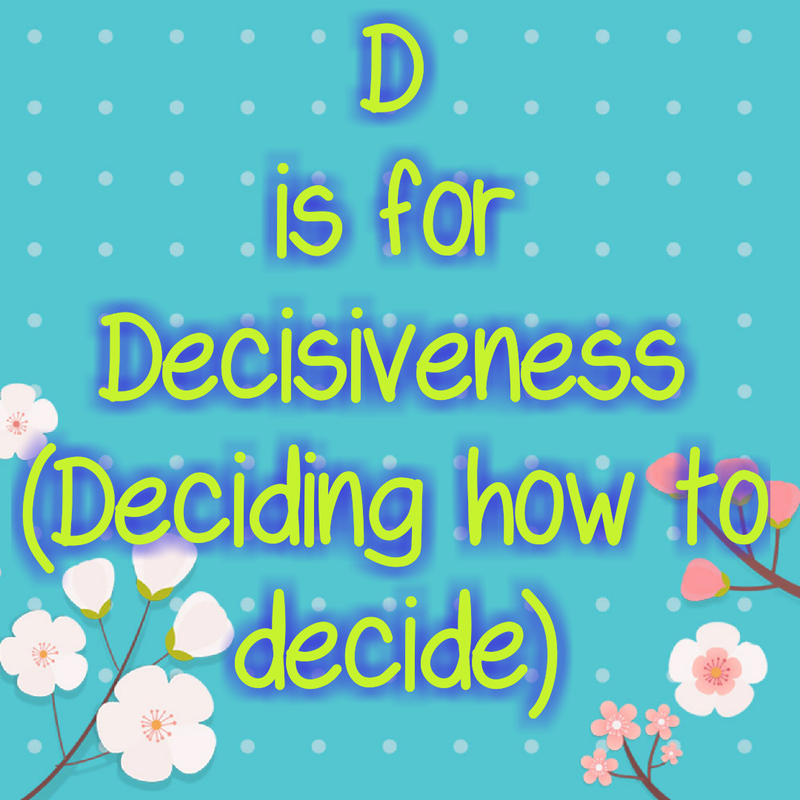 I agree being decisive is an incredibly important aspect of your life! Great read! I do have trouble with Being decisive. I usually say if I’m indecisive then I shouldn’t do it. Hi Crystal, Thank you for sharing your thoughts. Have you lost opportunities because of being indecisive? Great post, I’ve read that not making a decision is also a decision. I definitely relate to this. I can be a very indesicive person, partly because I’m always scared I’m choosing the wrong goal (I just did a post on this). Nice post! 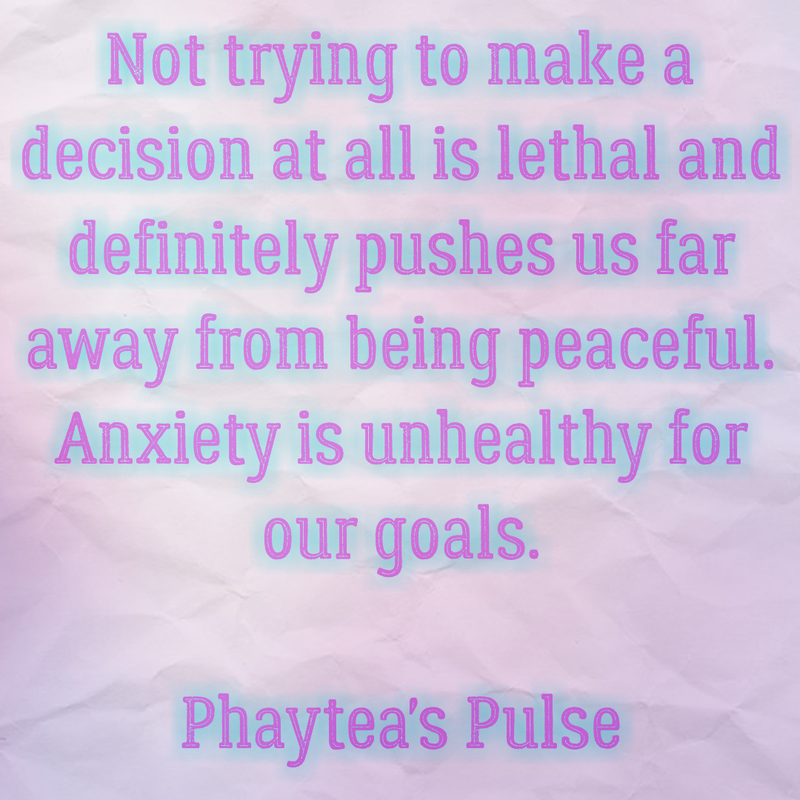 Phaytea, I left a message this morning but it hasn’t shown up. Could you check your spam folder? I love the opening story about your uncle telling you to pick what you want. I can just imagine it. Good tips for being decisive. I once heard a quote that successful people are quick to make a decision and slow to change their mind. It always happens that way! Whrn someone asks you yo decide on the apot we go clueless. And I think it is because of that planning your devisions are soooo important. Interesting post. There is another way: to live without great decisions. Excellent post with some really good solid advise. Previous Post Communication (words are not enough).